You have to love the WordPress function that allows you to schedule a blog post for delayed publishing. As you read this, I am on an internet/cell phone free vacation somewhere in Italy. Yay! 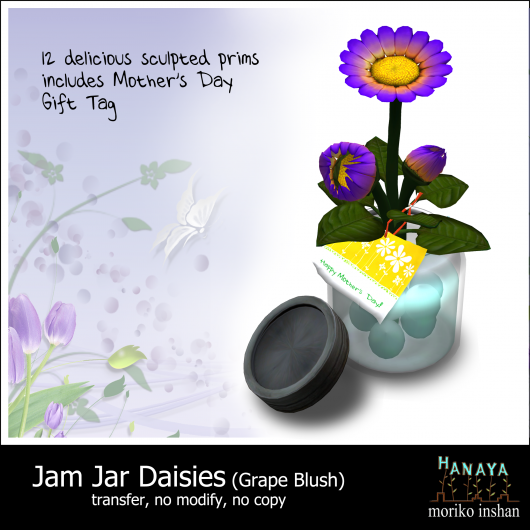 But I had to share some more brand new releases from –Hanaya- that are available at the Home & Garden Expo. I do a lot of custom work for store and home owners, and one thing I find is that many people like curved bridges and walkways that allow for extra interest as you move through the landscape. Our curved bridge is a building component that is part of our custom-landscape design portfolio, but it works well as a stand alone piece. The bridge itself is 4 prims, with a Land Impact of 15. The piece is fully retexturable – it comes with a simple wood finish but can be modified with any wood texture you like. Talk to me if you need texturing assistance! This lamp bears my name .. because it is a total replica (from memory) of my first lamp in my first apartment after I finished university. It is pretty and multi-functional – the glass shelves work great as a display area for a plant or a special item, and the lamp itself turns on/off by touch. The set includes a low poly as well as high poly model for your convenience. We hope you have time to visit all the awesome stores at the Home & Garden Expo, and that you will drop by and see us as well. We are located at Dreamseeker Home Expo14 . 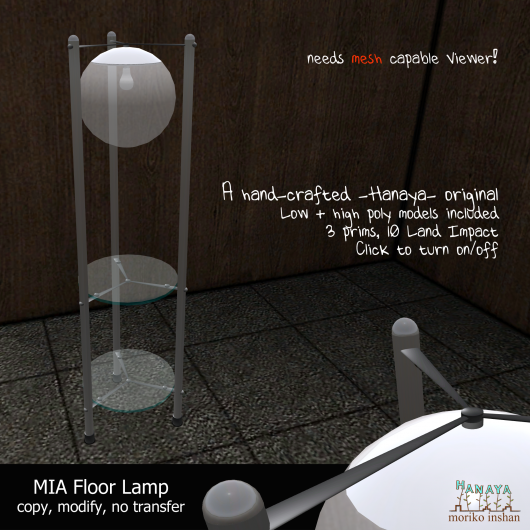 This entry was posted in Events, Product Announcements and tagged Second Life Home & Garden Expo on May 19, 2012 by moriko. My team and I are excited to be one of the exhibitors at this year’s Home & Garden Expo – a fabulous event which benefits Relay for Life. 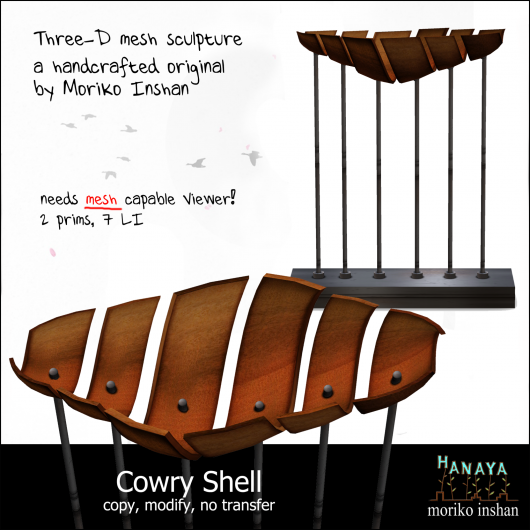 The Cowry Shell is probably my favourite piece for the Home & Garden Expo. It is a 100% mesh 3-D sculpted piece that I hope will look great in your house, store or garden. Although I generally sell my art pieces as no-modify – this one is mod, so that you can size it to fit appropriately into your space. I have to admit that I get teased about making primmy stuff. And I do, and will likely continue to do so. But for those of you who have come to appreciate the quality of the products from our store may like this simple table and chairs set. At only 5 prims / 5 Land Impact points for the whole set, even a prim-miser should be happy! The set is 100% mesh with baked textures, and includes chairs with menu-driven poses for guys and girls. If you like this set, and have more prims available, you might like our Miku Modular Deck Set. 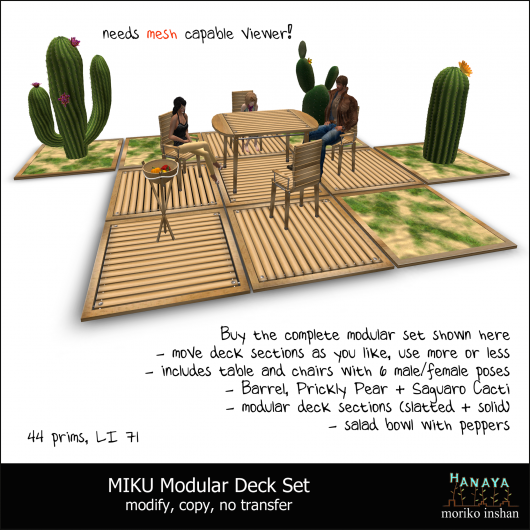 The Miku Modular Deck Set includes the table and chairs described above, plus 5 types of deck building blocks as shown in the image. The basic slatted and solid blocks are only 1 prim/1 LI each including shadows. The cacti building blocks vary in prim count, depending on the type. Our mesh salad bowl, based on a real life one in my pantry, holds colourful peppers to add a touch of tex-mex ambiance to your outdoor environment. So come visit us at the Home & Garden Expo starting on May 19th – we are on Dreamseeker Home Expo14. 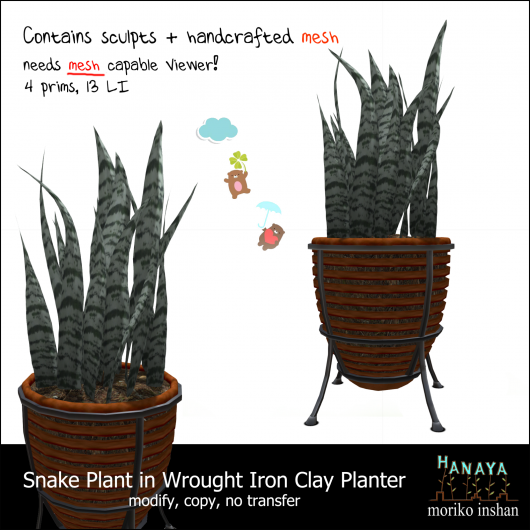 This entry was posted in Events, Product Announcements and tagged Second Life Home & Garden Expo on May 16, 2012 by moriko. Only five prims/five land impact points – perfect for prim savers or Linden Homes. And colourful. These words best describe the mesh table and stools set, a new release from -Hanaya-, currently only available at the Culture Shock event. The stools contain a sequence of 3 PG poses for girls, and the whole set can be retextured and recoloured as you like. And since the event is benefiting Médecins Sans Frontières, we have a whimsical little mesh item for you – the Jetsons Asparagus Garden. We stuck with our colour-scheme for the event, but also made the item texturable and re-colourable, so you can match it to your environment. So please stop by and visit our store on Purple Street now that the event is not so lagged, and grab a copy of our gift to you – the -HanayaMesh- Discohog. The event runs until May 26th, 2012. Hope to see you there! This entry was posted in Events, Product Announcements on May 15, 2012 by moriko. 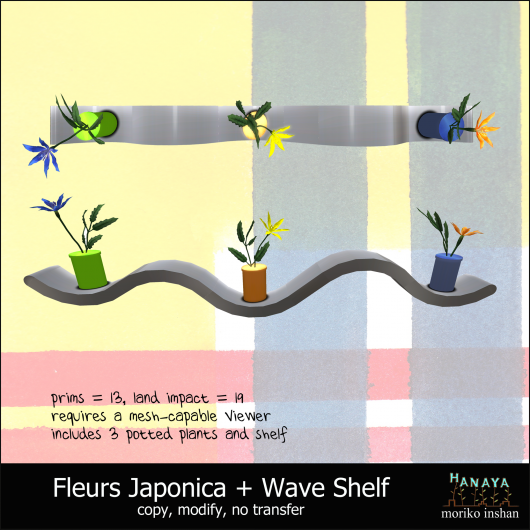 A one-of-a-kind mesh shelf with 3 Fleurs Japonica is the -Hanaya- item for Keep Calm and Keep Shopping Event. The event starts on May 14th and continues through May 28th. Unlike other shopping-related events in Second Life, this one has a twist that will take shoppers to individual stores rather than one laggy location. For a list of the participating merchants, check the Keep Calm and Keep Shopping Event web site. Each store has at least 1 brand new, never to be sold again item. Promises to be tons of fun shopping, and perhaps you will discover stores that are new to you. This entry was posted in Events, News on May 14, 2012 by moriko. My real life garden is in full bloom with spring flowers, and our lawn (which we do not use herbicides or pesticides on) is covered in teeny little white daisies. Just like my mom and dad’s used to be. 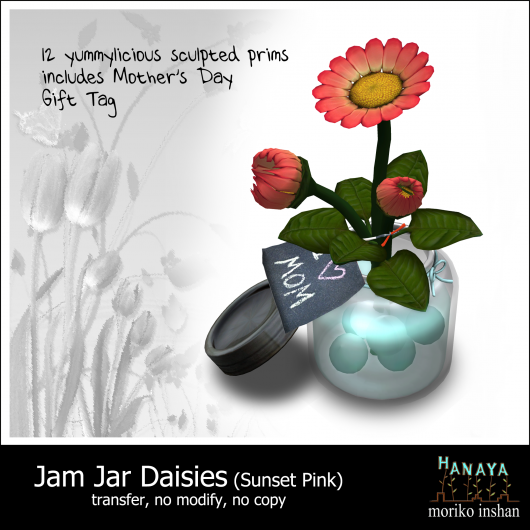 Since next weekend is Mother’s Day, we thought we would use some of them up to bring a happy smile to moms in Second Life. 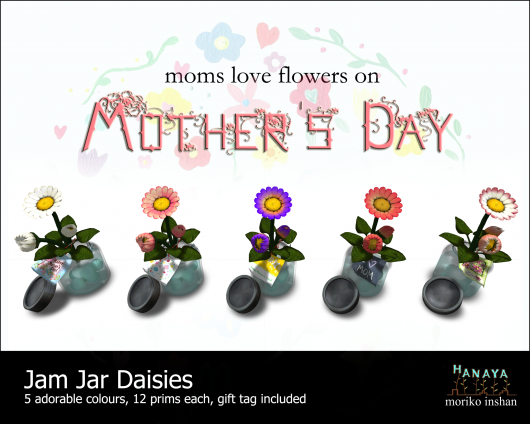 We popped 3 of the daisies in to a jam jar, propped them up with glass marbles and attached little Mother’s Day gift tags to each one. There is one fully open bloom, and two adorable buds – just like mom and two babies. We attached a sculpted gift card to let mom know these flowers were made for her very special day. Oh and there is a teeny little knotted bow peeking out from under the foliage. The white one is my favourite, but then that was my own real mom’s favourite daisy too, so that makes perfect sense. 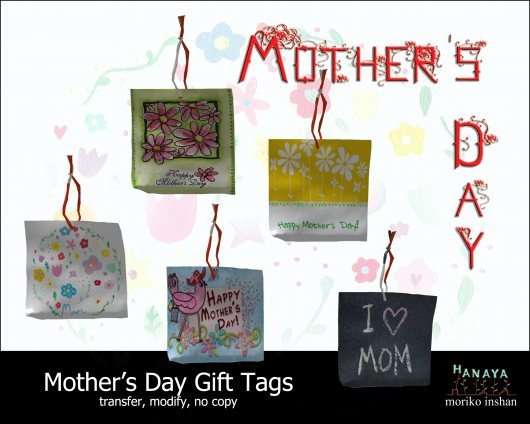 In case you decide to buy other gifts for your mom too, we packaged up our Mother’s Day gift cards for you to use. There are 5 styles in each pack – one of each, and they are mod/transfer. 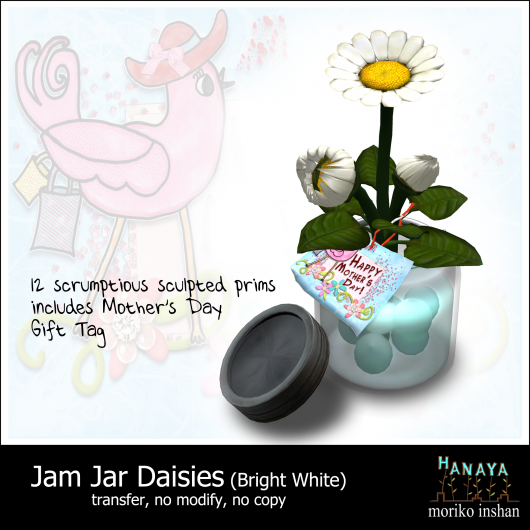 All of the -Hanaya- Jam Jar Daisies as well as the Mother’s Day Gift Tags are available for purchase on the Second Life Marketplace, as well as at our in-world store. All colours are on display in the New Releases area – so bring your mom along and get her to choose her favourite colour 🙂 Or better yet, suprise her. This entry was posted in Product Announcements on May 4, 2012 by moriko. While setting up the -Hanaya- store at Culture Shock, I could not resist spending some of my Lindens on this lovely jumper from Ricielli – just one of the awesome meshy things waiting for everyone at this year’s awesome event. Same as in the previous year, this year’s Culture Shock will benefit Médecins Sans Frontières, and is organized by the amazing Keira Seerose of CHIC Management. The event includes 180 brands and opens to the public on Friday, May 4th. Pics of all -Hanaya- meshy goodies, exclusive to Future Shock are coming soonest! This entry was posted in Events on May 3, 2012 by moriko. It has been absolutely ages since I have blogged! And no, it does not mean that there is nothing new. One of the reasons for being quiet is that I have been learning some new techniques in 3-D modeling. And after careful consideration, my team and I have decided to limit our use of meshes made by other creators in -Hanaya- products. Instead, we hope to continue to bring you meticulously crafted and textured creations (made from prims, sculpts and original meshes) that are not available elsewhere. 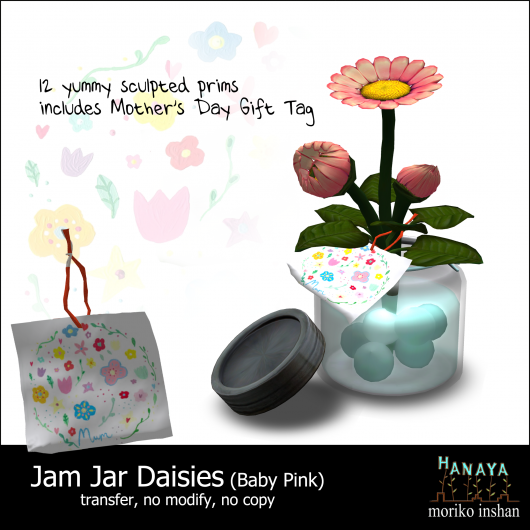 The group gift for our VIP Customer group, -Hanaya- Yummy Collectibles, was sent out today. It is a summery welcome sign embellished with sculpted daisies and hand-drawn textures. The sign is mod/copy, and comes in 2 sizes – a standard avatar size and sized for petites. If you missed the group inventory offer, the gift will remain available, as always, in the customer information area of our in-world store for the month of May. For those of you not part of our VIP group – I invite you to join us. The one time group-join fee is 250 Lindens. Look for us on Purple Street, starting on Friday, May 4th. All products for Culture Shock from -Hanaya- are brand new and are either 100% mesh, or combination of mesh/sculpts. 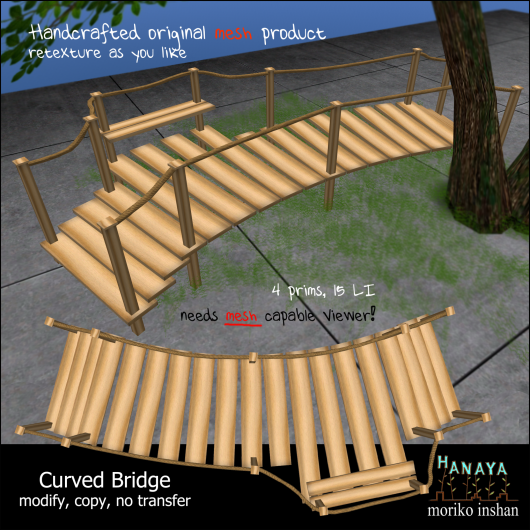 More awesome original meshes from -Hanaya- for your home, business and outdoor spaces. Look for us on Home Expo 14 starting on May 19th. The event, which starts May 14th, guarantees each participating merchant will be selling a brand new, not-to-be-sold-again product, which will be created specifically for the event. More information and images of products for these events are coming up. Have a great day! 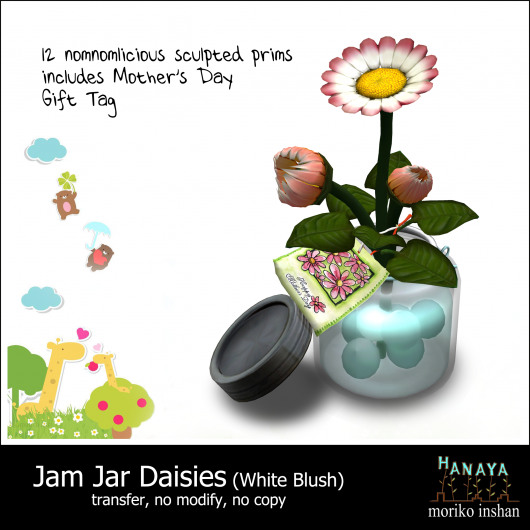 This entry was posted in Events, Freebies and Gifts, News, Opinion and tagged Culture Shock, group gift, Keep Calm and Keep Shopping, mesh, Second Life Home & Garden Expo on May 2, 2012 by moriko.